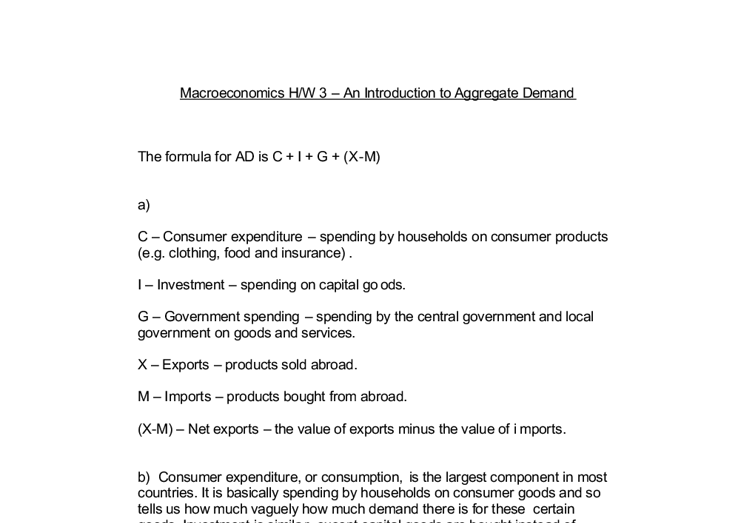 Macroeconomics H/W 3 - An Introduction to Aggregate Demand The formula for AD is C + I + G + (X-M) a) C - Consumer expenditure - spending by households on consumer products (e.g. clothing, food and insurance). I - Investment - spending on capital goods. G - Government spending - spending by the central government and local government on goods and services. X - Exports - products sold abroad. M - Imports - products bought from abroad. (X-M) - Net exports - the value of exports minus the value of imports. b) Consumer expenditure, or consumption, is the largest component in most countries. It is basically spending by households on consumer goods and so tells us how much vaguely how much demand there is for these certain goods. Investment is similar, except capital goods are bought instead of consumer. It is the most volatile component of AD, as it may rise by 60% on year, but fall by 20% the next year. Government spending does not include transfer payments or job seeker's allowance as they do not involve the government itself buying goods and services.Net exports add foreigners' spending on the country's goods and services and deduct spending by the country's population on imports. ...read more. - Expectation: firms are more likely to invest if they feel optimistic about future economic prospects. The extent and speed of changes in expectations are the main reasons for the volatility of investment. - Capacity utilisation: firms may look to invest if they are currently operating at close to full capacity. However, in contrast, if they have considerable spare capacity, they may be able to increase output without buying new capital. e) 3 determinants of exports (X):- - Real disposable income abroad: a rise in income abroad is likely to result in more exports being sold. E.g. the USA is one of UK's main trading partners. If people in the USA enjoy higher disposable income, they will buy more goods and services, some of which will come from the UK. - The exchange rate: As well as being influenced by the inflation rates, the price of exports and imports are also affected by exchange rate changes. A fall in a country's exchange rate will reduce the price of exports and raise the price of imports (and vice-versa). ...read more. Another way increasing house prices will also lead to an increase in AD would be because a rise in house prices tends to lead to an increase activity in the housing market, i.e. more people choose to buy or sell their house. Thus, a new house would probably mean new furniture and household accessories, hence increasing spending in those markets. As AD would increase, the graph would look similar to that in part (a). d) A recession in North America may lead to fewer exports by the UK as the USA is a major consumer of the UK's products. This would be because there would be less disposable income in the USA and therefore it would be unnecessary for the USA to buy our products as many of them will remain unused or not purchased. Consumer confidence in the USA would be low as people may be scared about losing their jobs. Therefore, as the USA is one of the UK's main trading partners, there would be fewer exports overall by the UK. Therefore, people living the UK's net exports would be lower, and so the AD would shift to the less as it would decrease. The shift in the AD graph will be similar to that in part (b). ...read more. This essay engages with the question superbly. There is a clear understanding of the composition of aggregate demand, shown by an inclusion of the formula and the components. I would've liked to have seen a definition of aggregate demand, along the lines of "the total demand for goods and services in the economy at any given price level". There is plenty of analysis of the components which contribute to aggregate demand, but a short definition would make for a strong introduction. The analysis in this essay is strong. This is due to the discussion of the determinants for each component. I liked how there was a discussion of which component is largest, yet they could've built upon this to make a simple judgement on which component is most significant. Doing so would've gained credit for evaluative skills and a perceptive debate. Each determinant is explained well, with the mechanism clearly shown. I would note that it's important in Economics not to jump any steps, as this shows a lack of understanding, suggesting to the examiner you have simply rote learned it from a textbook. I liked how this essay looked at a number of scenarios affecting aggregate demand, using diagrammatical analysis to show the affect on real GDP. It is important to explain why the aggregate demand curve will shift, and this essay does this extremely well. They start with the change, for example a decrease in the interest rate. They then say how this affects consumption, rather than simply stating it will. 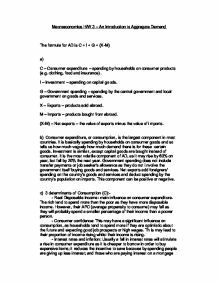 If I were doing this essay, I would be slightly more explicit in saying that consumer expenditure is a component of aggregate demand, thus an increase in this will cause a right shift in aggregate demand. It may be useful to look at the multiplier effect to gain the highest marks! The essay is structured well, addressing a new point in each paragraph. I liked how this essay doesn't repeat itself, but uses the previous paragraphs to back up their new points. This makes for a convincing argument and a flowing style. Spelling, punctuation and grammar are strong. This strongly suggests that the inflation in UK is cost-push inflation. Cost push inflation-an underlying concept in this article, is inflation arising on the supply or cost side of the economy. The theory of cost push inflation explains rising prices in terms of factors that raise per-unit production costs or the average cost of a particular level of output. M, imports, however has a negative impact since the level of money inside the UK will fall as it flows abroad due to the purchasing of foreign goods. The magnitude of the deregulations will also be reduced by the addition of further regulations entrenched in incentives and initiatives introduced in the near future. Whilst Gordon Brown announced that the government was closer than ever to achieving full employment throughout the UK, he explained the second stage of Britain's New Deal. Another method of protectionism is exchange rate manipulation. The government sells its currency in the foreign exchange market so as to lower the value of Pound. Therefore, the cost of imports will be higher than before, and exports seem more sensible. A change in budget deficit therefore will clearly affect aggregate demand; government expenditure is a direct factor and therefore is likely to contribute towards an endogenous shock to aggregate demand, especially if a government chooses to follow an expansionary fiscal policy.